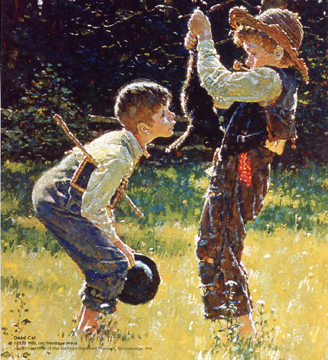 It’s been a long time since Aunt Polly said to Tom Sawyer, “Well, go ‘long and play; but mind you get back some time in a week, or I’ll tan you.” I was thinking of the changes in the freedom children used to have and how cautious parents must be today. 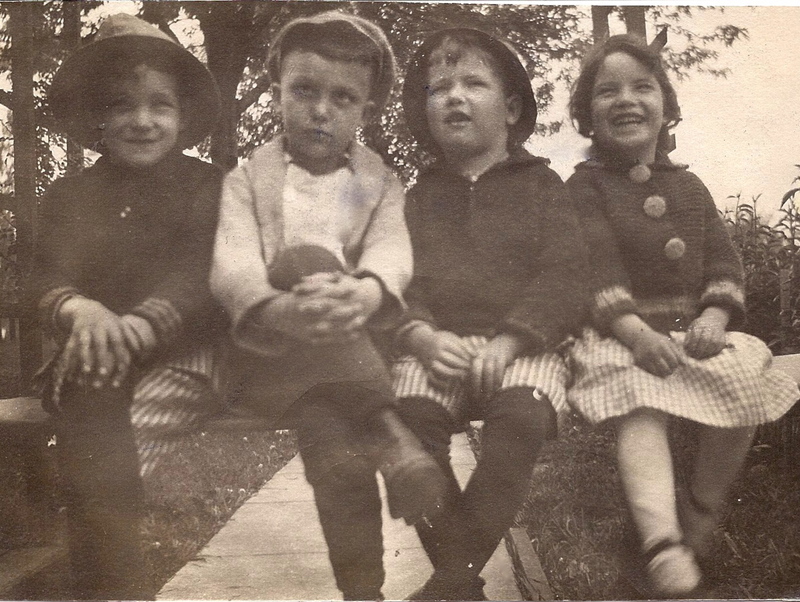 What I realized is that there always have been perils for children and there always will be. A friend of mine says his grandfather remembered running away from an orphanage in Texas with his older brother at the fence telling him to keep running. He was 6 years old and was on his own from then on. That was in the late 19th century and there were many dangers for a young child, from natural dangers to human ones, but he survived to a ripe old age. My grandparents were raised in small towns or on farms where they had the run of the place. My grandfather wondered around town because everyone knew who he was and watched out for him. I know parents have always worried about what would happen to their children, but they used to be able to let them stretch their wings and explore. My father spent many years in the same small town his parents grew up in and played with his brother and sister and cousins. The Ohio River ran right by the town, but none of them ever drowned in it. There were few cars, but I guess you had to watch out for buggies and horses, too. They probably knew who the creepy people in town were and stayed away from them. There have been sick minds since man was created, so we didn’t invent perverted behavior in this century. I can picture these kids running around that small town with all the freedom in the world, as long as they didn’t get into trouble, which meant damaging property or bothering someone. In 1909, Bud and Temple Abernathy, the Abernathy Boys, rode horses alone from Frederick, Oklahoma (barely a state then) to Santa Fe, New Mexico. They were nine and five years old. Alone! Of course, their father was “Catch-’em-alive Jack” Abernathy, a US Marshall whose reputation as a marshall, a hunter and a cowboy helped save them from Indians and crooks they met along the way. Still, they had to cross a lot of land with the dangers of wild animals and the terrain. After that trip, they rode from Frederick to New York City and drove a car back (when there was only 150 miles of highway in the entire country). They did it alone and they were only ten and six! Even then, that was quite a big deal and they became national celebrities. Can you imagine any kids that age being able to do something like that today? 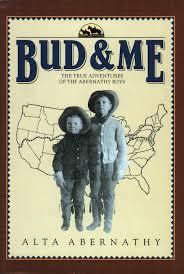 Kids should read “Bud & Me” to at least be able to know that those kind of experiences once existed. I grew up in the city, in the suburbs. We walked everywhere and I don’t remember too many restrictions. We had to watch for cars, but we were allowed to explore and walk to our friends’ houses blocks away. The biggest dangers were falling off your bike (we had no helmets) or jumping out of a tree. I’m sure there were cautions from our mothers, but we just went out and did what we did. If there was an accident, we went home and our mothers put a bandaid or iodine on it. Most, maybe all, of my friends’ mothers were at home and the neighbors all knew who we were, so there was a safety in that. As we got older, we moved where there was a creek behind the neighbors’ houses and we played in that, especially when the water was rising. We played on construction sites, we played with matches, we played after dark and we snuck out to play in the moonlight. We got scratched and banged up from time to time, but that was just part of it. When I was a teenager, we drove everywhere. There were no cell phones or GPS, so our parents just had to trust us to get home safely. We explored all parts of the city and did crazy stupid things. We weren’t always smart, but we learned how to use our freedom the best we could. I’m sure my parents worried some, but they let us experience what was out there and find our own limits. We were lucky in that drugs weren’t common until I was in college and the worst that happened was that kids got into their parents liquor or drank too many beers. By the time my children were growing up, it was a little scarier. There were so many more cars and we had television to tell us of kidnappings and other evil things. Some mothers were working and there wasn’t always the safety of knowing that there were other moms to let you know what was going on. We had creeks by both of the houses my kids grew up in and they played around them. I didn’t know until they were much older that they used to follow the creek all the way to the busy street and under the street to the other side. There were snakes and critters and all kinds of exciting things in the creek, but it didn’t bother me. That was part of childhood. I did caution them when we had a big rain and the creek rose and could have carried them away, but I’m sure they watched that rushing water with the same fascination I did. They also were free to walk around the neighborhood as long as I knew where they were headed. There were a lot of other kids around. When my children were teens, insurance rates were rising for their age group for drivers, drugs were more common and alcohol was a bigger factor. City-wide curfews were coming into being and kids had to move from place to place to gather when they were out. The fun was getting harder to find. Now, I’ve watched my grandkids grow up playing mostly inside with television and video games. They ride their bikes, but not with the same freedoms we enjoyed when we could ride for miles alone. There is the fear of having the bikes stolen, the heavier traffic, the crazies we all know are out there. It’s just not as safe as it used to be. They don’t ride to the park for a quick game of ball or to climb rocks or explore creeks or make new friends in random places. They have helmets and padding and cell phones to check in and every protection there can be. It’s dangerous out there. Today, it’s all organized for kids with parents swarming over everything they do. I’m not saying they’re over-protected, because I’m well aware of the dangers. I just don’t know how far we have come. We’ve conquered many of the childhood diseases that killed so many in the past, but we’ve taken away the ability to explore and learn what you can do by yourself. There’s a certain pride in knowing that you’re able to walk to the store by yourself or ride your bike to a far away place and return without anyone helping you. You gain confidence in your own abilities and skills. This weekend, I watched a news story on the new plague of heroin users among our teens across the country. Heroin in the suburbs. What can you say?